?Chill-out? pieces to enjoy between exams. Fun Club continues, with a flute edition, including a free CD containing the performance and backing tracks. A teachers edition is also available. Alan Houghton studied piano at the Royal Academy of Music and spent many years in education where he became Deputy Headteacher and Co-ordinator of Music. Having left mainstream teaching, he has become established as a well-known and successful composer of music for the early grades, his music being published by the Associated Board and OUP. Many of his pieces are set for Associated Board exams. Apart from running the ?Olney Music School?, he is also a well known jazz pianist and classical accompanist. Fun Club for Flute: Student Edition, Grade 0-1 was published by Kevin Mayhew in July 2016 and is our 18868th best seller. 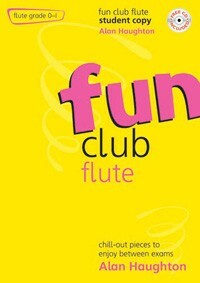 The ISBN for Fun Club for Flute: Student Edition, Grade 0-1 is 9781844179671. Be the first to review Fun Club for Flute: Student Edition, Grade 0-1! Got a question? No problem! Just click here to ask us about Fun Club for Flute: Student Edition, Grade 0-1.